Aaaand here's the final Spinophorosaurus. I went for a sort of African color scheme, because he's from Niger and all. This was a case where I didn't initially like the colors as I was doing them,but I think they come together pretty well in the end. Now I'm going to take a short break while I make some lunch and ink Brachytrachelopan. Love the stegopods by the way, looking forward to the rest! again very nice piece (sorry going from the top down on these posts). It could also be influenced by the famous yellow & brown animals of modern Africa (giraffes, lions, etc.). 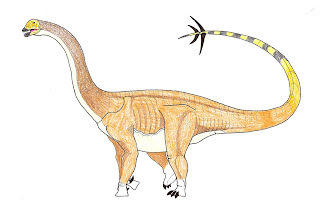 I have the feeling that there are other colour/marking schemes that seem to be subconsciously associated with Chinese dinosaurs, but I'd have to see one to recognize it.